Computer Tomography (CT), sometimes called "CAT scanning," uses special x-ray equipment to obtain image data from different angles around the body, and then uses computer processing of the information to show a cross-section of body tissues and organs. CT is particularly useful as it can show several types of tissue: lung, bone, soft tissue and blood vessels with great clarity. Using specialized equipment and expertise to create and interpret CT scans of the body, radiologists can more easily diagnose cancers, cardiovascular and infectious diseases, and trauma and musculoskeletal disorders. CT of the body is a patient-friendly exam with little radiation exposure. CT exams are often used to plan and properly administer radiation treatments for tumors, and to guide biopsies and other minimally invasive procedures. 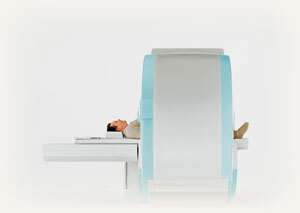 The technologist begins by positioning you on the CT table. 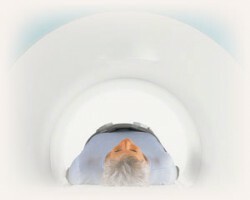 Your body may be supported by pillows to help you hold still and in the proper position during the procedure. As the study proceeds, the table will move slowly into the opening of the CT scanner. A CT exam often requires the use of different contrast materials to enhance the visibility of certain tissues or blood vessels. The contrast material may be injected into your blood stream, and/or given orally depending on the type of exam. If you are diabetic and on oral medication, a special prep may be necessary. If you have a known allergy to intravenous x-ray contrast, you may also require a special prep. To determine if you will need a special prep, please call 559.447.4000 and ask to speak with a nurse regarding your CT. Please do not eat or drink anything beyond the necessary preparatory items listed below (i.e. no coffee, tea, or food) for four (4) hours prior to your exam. Drink one (1) bottle of CT contrast fluid one (1) hour prior to your exam You have the option of arriving one hour prior to your appointment to drink the contrast fluid, or you can visit AMI the day prior to your exam to pick up the contrast fluid. The technologist will provide you 8 ounces of water to drink immediately prior to your exam. If the exam is ordered with contrast only or with & without contrast, do not eat anything four (4) hours prior to your exam. If the exam is ordered without contrast, no proparation is needed. If the exam is ordered with contrast: Do not eat or drink anything four (4) hours prior to your exam. If no contrast: No preparation is needed. Kidney stone only: No preparation required. If exam ordered for any other reason: Follow the instructions provided for a CT of the Abdomen. Please do not eat or drink anything four (4) hours prior to your exam. Wear comfortable, loose fitting clothing. Metal objects can affect the image, so avoid clothing with zippers and snaps. You may also be asked to remove hairpins, jewelry, eyeglasses, hearing aids, and removable dental work. Women should always inform their doctor or the technologist if there is any possibility that they are pregnant. What will I experience during the exam? CT scanning causes no pain. For different parts of the body your preparation will be different. You may be asked to swallow a liquid contrast material that allows the radiologist to better see the stomach, small bowel, and colon. Often times a contrast material is injected into a vein to better define the blood vessels and kidneys, and to accentuate the appearance between normal and abnormal tissue in organs such as the liver and spleen.